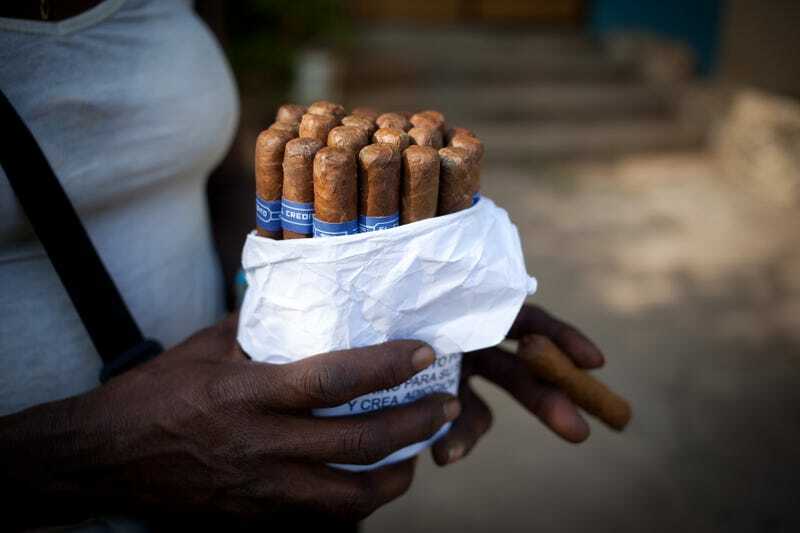 A woman sells cigars on the street in Havana on Dec. 20, 2014. Time to throw up your Cohibas! The Obama administration announced Friday new measures to further ease trade, travel and financial restrictions on Cuba as President Barack Obama seeks to make open relations with the island nation “irreversible” before he leaves office, Reuters reports. “Today, I approved a Presidential Policy Directive that takes another major step forward in our efforts to normalize relations with Cuba,” Obama said in a statement. The new measures include a lift on limits on the amount of Cuban rum and cigars travelers can bring home for personal use. Prior to the announcement, the most one could bring back was $100 worth of the highly coveted contraband. Now American travelers can bring into the U.S. as much rum and cigars as they desire, as long as it remains for “personal use.” You still cannot order the delights via mail. “You can now celebrate with Cuban rum and Cuban cigars,” U.S. National Security Adviser Susan Rice quipped as she laid out the policy changes in a speech to a Washington, D.C., think tank on Friday, according to Reuters. The two countries began normalizing relations in December 2014, and the new rules allow the U.S. to export some consumer goods sold online to the country, and also allow U.S. firms to improve Cuban infrastructure for humanitarian purposes, the U.S. Treasury and Commerce departments said in a statement. In addition, Cuban pharmaceutical companies are now able to apply for U.S. Food and Drug Administration approval. Though a Republican-controlled Congress has long opposed any easing of the 50-year-old economic embargo against the country, the president has been able to begin to lift some of the restrictions without the legislative branch. Democratic presidential nominee Hillary Clinton backs the policy of rapprochement with Havana. Republican Donald Trump has vowed to roll back Obama’s executive actions. U.S. law still bans general tourism to Cuba, but the administration has made it easier for Americans to visit the island nation under 12 officially authorized categories.